Firstly I would just like to say a huge THANK YOU to all who have come back and supported me this year already. The comments on my previous posts have blown me away. They mean the absolute world to me and give me so much encouragement and inspiration to carry on. Often I have second thoughts about posts and recipes. I wonder whether anyone will like them or want to read them. I take great pride in my posts and photos, then wonder if I am wasting my time. So the comments on my Banana Bread recipe and my Favourites of 2016 post have really given me that boost I needed. A comment generates conversation, encourages discussions and helps build a relationship between me, sat here behind my screen and YOU, sat there behind your screen. I encourage you, yes YOU who is reading this now, when you finish, come and find me on any of my social media profiles and say hello, I will reply! I would love to get to know you all better, after all there are over 9,000 of us! OK on with today’s post…. I love and I mean LOVE juicing. I find it so satisfying pushing veggies through the funnel, seeing the juice run out and most satisfying of all, the taste of them, which is pure freshness and zing. What I don’t love is paying a lot of money to make them, the time it takes every morning to prepare them and even more, paying someone else A LOT of money to make them for me! – and I find the ones in the supermarkets just don’t taste good. I am going to share with you my secret way of enjoying a juice every morning, that has been made in your kitchen, efficiently and super cost effective. For the purpose of this post I have done my shopping at Aldi and used prices as they stand on the 11/01/2017. I didn’t purchase any special offers so the price below is worked out at full cost, so if you catch any of the items when on offer, you will save even more! Yippee! I managed to make 8 x 400ml (approx) Juices ( 4 x Green Juices & 4 x Carrot Juices) with the ingredients below. The juice you get does depend on the individual vegetables and how juicy they feel, but if you pour them out equally, you will still get 4 portions of each juice to enjoy. Make sure you have 8 empty containers to decant your delicious juice in to. The only requirement is that they have an air tight lid/top. I have used empty 500ml water bottles, but you can use mason jars, jam jars, glass bottles, how ever fancy you wanna be. I find it easier to use plastic bottles because the juices I want to enjoy later in the week, I will pop in the freezer. Did you know you could freeze juices? I only found this out myself a few months ago. This makes this method even more cost effective. To defrost just pull your juice out the freezer the night before, give it a shake and enjoy. That reminds me to tell you, when juices are stood still, it will cause separation. PLEASE do not be put off by this, all you have to do is shake shake shake and it will be just fine. Divide by 8 servings  = 66p!!!!! Let’s juice these bad boys and bring on a week of that tasty goodness. 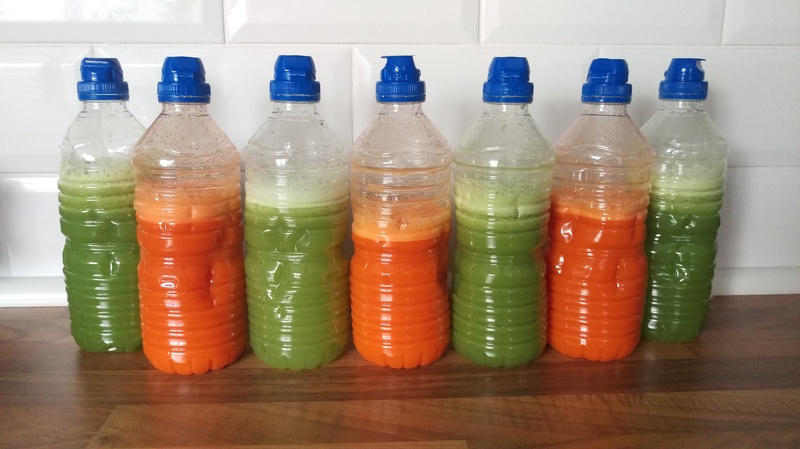 Set aside 30 mins to get busy bulk juicing, because all juices are made in one go, there is no need to be dragging that big ol’ noisy juicer out every morning and scaring the neighbours half to death or deafening yourself before work. Win! Once you have your 8 juices all bottled up, work out how many you are going to drink in the next few days. I go with one juice a day. I will keep out 3 days worth and put the rest in my freezer. Some of you might like two juices day, it is completely your preference. Oh and one more thing! Do not throw out the pulp, I repeat DO NOT THROW OUT THE PULP!! – To avoid any waste, I even use that too. I will be sharing pulp recipes next week. Make sure you are subscribed (at the bottom of my blog) so you know when that exciting post is published. You will not be disappointed. Well that’s it folks. You now have 8 delicious juices, that cost only 66p each, you know exactly how they were made, what they were made with and will included no waste, if you come back, same time next week to see some yummy ways to use up that nutritious pulp. I have kept to two quite simple juices. If you wish to pimp with super green powders or top with chia seeds, go ahead. You can also choose to buy your veg from a local farm shop. I would love to know what juice combinations you enjoy? If you have found this post useful please do click that ‘like’ button and feel free to share with your friends. I will be lurking down below in the comments ready to read your favourite juice combos and ready to answer any questions you may have!